Several years ago, PMM’s then-editor, Bill Parlatore, and I contemplated and eventually undertook a passage from Chesapeake Bay to Bermuda aboard a 30-foot single-screw trawler. As one might imagine, a great deal of discussion was had by all parties involved on the subject of the reliability of the propulsion system and the potential need for a backup plan, or what’s commonly referred to as a get-home system. After much deliberation, and a scarcity of realistic options, there was no room for a second engine or drive mechanism. We briefly considered a Yanmar diesel outboard, but they were at the time, and remain, unavailable in the United States because of their failure to meet emissions standards. So we opted to go solo as it were: one engine, one shaft, and one propeller. We were careful to ensure that the engine and running gear were in good working order, that the fuel was clean (we did suffer from minor contamination, however, we had upgraded the primary filtration system as part of the vessel’s preparation and as a result it wasn’t debilitating), and sufficient spare parts and tools were on hand. As it turned out, the engine never skipped a beat over the course of the roughly nine-day roundtrip passage. As I’ve mentioned in previous columns, the “Five Ps” (proper preparation prevents poor performance) play a strong role in the successful completion of any passage, including the one described above. This goes for any system aboard your vessel for that matter, including the engine. Thus, a get-home system should never be thought of as a substitute for a failure to adhere to the Five Ps. Many single-screw vessels, both recreational and commercial, ply the oceans of the world safely and reliably because they are well designed and properly maintained. Having said that, and having discussed the subject with many current and would-be cruisers, I’m confident that some folks simply won’t feel comfortable without an alternative in the event that the main single engine packs it in; they need an option, either in the form of twin engines or a get-home system. While the vast majority of propulsion system problems are fuel-related, fuel that would likely feed the get-home system as well, there are times when another, stand-alone form of propulsion would serve as the cruiser’s deus ex machina. Where and how one cruises is yet another factor to consider when weighing the options and determining the necessity for a get-home package. Those who cross oceans, travel well out of sight of land (and VHF/cell range), or those traveling far off the beaten path and far from knowledgeable professionals, understandably feel a greater need for propulsion self-sufficiency. If you fall into the “get-home” camp, then you have some homework to do because there are a variety of options and precious little information about them that’s readily available. In fact, if you Google “get-home engine,” “get-home system,” “come-home system,” or variations thereof, you’re likely to get a mix of information on everything from marine propulsion and thruster systems to home security, cinema, and alarm manufacturers. It’s worth noting that, as is often the case, some manufacturers of this equipment are more responsive and customer-oriented than others. Because excellent support from manufacturers of all marine equipment is a mantra of mine, I feel compelled to include it in this discussion. In at least one case, a series of emails sent via a “Contact Us” link on the manufacturer’s website requesting additional information on their product, specifically stated as being for this article, went unanswered. It’s well worth establishing a dialog with the manufacturer to gauge and ensure adequate support if you intend to utilize one of the proprietary get-home systems before making your decision. Surely among the most ubiquitous of mechanical get-home options is the stand-alone wing engine. This approach represents the most reliable, and perhaps the most costly, get-home option. Wing engines essentially transform a single-engine vessel into a twin screw, albeit with a significant disparity in the power between the two engines. A wing engine itself is often no different than the main, just smaller. It typically includes all of the same accessories, options, and related components and falls under the same manufacturer installation requirements (which should be verified). In many cases, to aid in the utilization of space, wing engines will employ a V-drive transmission, wherein the wing engine shaft passes under the engine. The wing engine shaft passes through the hull via a stuffing box and shaft log assembly, just like that of the main engine. However, unlike most main engine shafts, which pass through the keel, the wing shaft relies on a strut for support. One of a single-screw, full-keel vessel’s primary attributes is the protection it affords its running gear in the event of a grounding or collision with a floating object. The wing shaft, strut, and propeller are afforded no such protection and are susceptible to damage or fouling from floating or semi-submerged debris, fishing gear, lines, nets, etc. The outboard shaft also imparts an effect on the vessel’s tracking, requiring a steering offset of as much as 20 degrees, which can make life hard on the autopilot, not to mention the helmsman. Still, with a little practice, steering is relatively easy when the wing is used and while it will get you there, don’t expect to break any speed records. In my experience most wing engines, depending on their horsepower, will propel a vessel in moderate wind and wave conditions at roughly half the hull speed. The wing’s external running gear does impart drag, affecting fuel economy to some degree. In order to reduce drag, wing propellers are typically of the folding or feathering variety (more often the former), and herein lies one of the wing engine’s liabilities. If not properly maintained they can fail to deploy when needed, especially if used infrequently. On several occasions I’ve encountered wing props that required a significant amount of effort for me to open during haulout inspections. Clearly all gear aboard your vessel benefits from being used regularly, perhaps none more so than engines; main, wing, and generator. On at least one occasion I’ve replaced a wing engine that seized from lack of use. 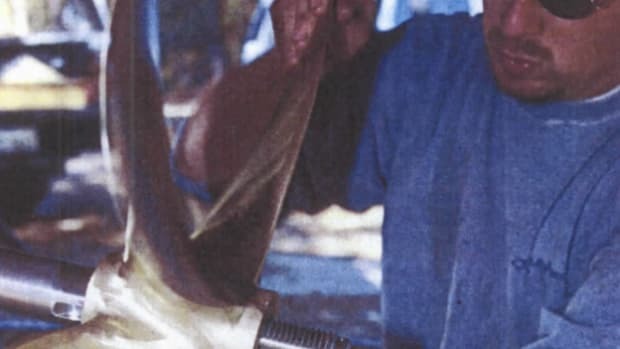 Moisture accumulation inside the cylinders, which likely migrated there from water trapped in the exhaust system via opened exhaust valves, caused the piston rings to fuse to the cylinder walls. I’m virtually certain this would not have occurred had the engine been used more often. Disuse promotes corrosion and allows oil to drain from bearings, cylinder walls, and other surfaces inside the crankcase. Thus, regular use is a must for all engines aboard, including or perhaps especially, the wing. For vessels that are in commission, wing engines should be started and run under load, i.e., to propel the vessel for 10–15 minutes at least monthly. When doing so the user should ensure that the engine’s coolant and oil reach operating temperature during the workout. Such running will circulate oil throughout the engine, heat the exhaust system, crankcase, and combustion chambers to disperse moisture and ensure the propeller’s folding mechanism is free of marine growth and is deploying properly. During haulout periods, wing running gear should be carefully inspected for growth, corrosion, and deployment resistance. Additionally, you should ensure that the shaft turns freely. Incorrect shaft alignment and swollen cutless bearings, both of which rob the engine of efficiency, are maladies occasionally experienced by all running gear, including that of wing engines. Propellers (along with the strut and shaft) should be treated with an antifoulant to prevent crustacean-induced seizure and drag. Feathering propeller gear mechanisms are encased and designed to be periodically disassembled, cleaned, and re-lubricated with high viscosity water-resistant grease, which is often supplied or specified by the propeller manufacturer. Folding propellers, on the other hand, utilize no internally lubricated gear mechanisms and do not require lubrication service. However, because of their infrequent use, some vessel operators choose to lubricate or pack folding propeller gear mechanisms with grease, likely reducing the possibility of gear seizure. (Grease may be washed out of the gears when the vessel is under way, even if the wing isn’t operating.) If you choose this route then utilize grease that is specifically designed for sea water immersion; my preference is for Lubriplate’s water-resistant Wheel Bearing Grease. A previously mentioned point, one often emphasized by wing engine opponents, is that if the fuel is the source of the problem, the wing engine is not a very effective alternative to a main engine that’s been hobbled by contaminated fuel. While this is true, builders who routinely install wing engines often address this liability by installing a dedicated wing engine fuel supply. PAE Nordhavn, perhaps the most prolific adherent to the wing engine concept, has over 400 wing-equipped vessels between 40 and 76 feet in service that currently utilize the dedicated wing fuel tank approach. While not nearly as voluminous as the main supply, a moderately sized dedicated supply of fuel, typically 10 gallons, will enable the user to motor some distance while resolving the issue with the main engine’s fuel supply by polishing and/or transferring. It’s important to note that the fuel in the wing engine’s reserve should be “turned over” or used periodically. If chemically stabilized it could be safely held for a year. If it could be polished periodically, the fuel’s quality would be assured and the storage duration might be increased, however, if it could be used by the main engine and simply replenished from time to time, that would be the preferred approach. While on the subject of mechanical “isolation,” it’s worth mentioning that in addition to providing an independent fuel source, the wing engine installation should be, to the greatest extent possible, as isolated from the vessel’s other systems as possible. That is, the wing engine should rely on its own starting battery, shift and throttle controls, and raw water supply. The battery, along with the generator, should be the same voltage as the vessel’s main engine and generator, 12 or 24 volts, to facilitate paralleling. If the shift and throttle controls are electronic, they can in some cases share a helm twin-shift control, however, the actuator or electronic interface should be isolated. Yet another wing engine approach utilizes a saildrive (these are typically used on sailing vessels—they vaguely resemble a miniature version of the now-familiar pod drive) coupled to a conventional diesel engine. Available from a small handful of manufacturers, the saildrive eliminates the need for a shaft and strut and its streamlined design offers low drag. It includes its own, proprietary folding propeller and anode. The primary advantage to the saildrive wing engine installation is its packaged, one-manufacturer nature and its ease of installation. Essentially, drop it in and you’re ready to go. In all cases the hollow, oil-filled leg is made of aluminum, which means it needs to be properly maintained, coated, anodically protected, and carefully monitored for signs of corrosion. 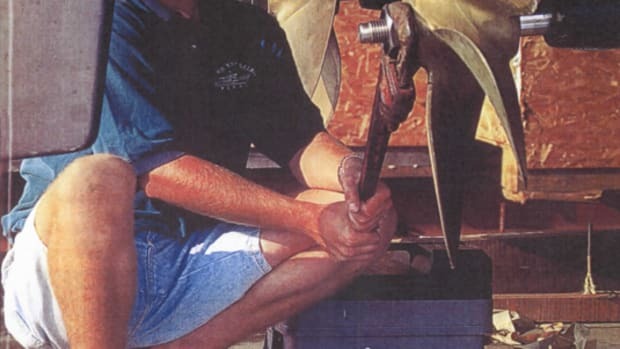 The interface between the saildrive and the hull is achieved using a large rubber boot, which also requires periodic inspection and replacement. As mentioned in the opening of this section on wing engines, because of their insular nature, it could easily be argued that they represent the most reliable of get-home options, albeit it is at a price. I’ve encountered, on one occasion, a hybrid belt-drive/wing engine system, wherein the wing engine’s output was transferred to the main engine’s shaft via a serpentine belt. This is a viable approach and I’m certain there are other variations I’ve failed to mention, however, the overarching requirements remain the same: reliability and ease of implementation. Provided those tenets are met, any variety or combination of systems may be employed. A final note on wing engines, one method of ensuring that the wing is exercised regularly is to enable it to power the vessel’s hydraulic gear such as stabilizers, windlass, and a hydraulic bilge pump. In some cases wing engines have been set up to operate large alternators for more effective and efficient battery charging. With this approach, you can be assured that the wing will be used any time the accessories it powers are needed. Some, including this author, would argue that many vessels already have the means for auxiliary propulsion in the form of a generator. After all, generators are existing, dedicated, independent sources of power that are, with the exception of the fuel supply, completely isolated from the vessel’s primary propulsion system. The obvious challenge is how to put all that internal combustion power to use. The answer comes in the form of hydraulics. Hydraulic pumps, motors, and controls are common, well understood, easily serviced, and routinely used within the marine industry for stabilizers, thrusters, cranes, and other accessories. The generator’s engine becomes, via a power take-off (PTO), the power source for a hydraulic pump, which can be used to power, among the aforementioned items, a hydraulic motor that is, in turn, used to propel the vessel. Utilizing this arrangement, the hydraulic “power” can be easily channeled via high-pressure plumbing from the generator to a hydraulic motor and from there, to either the main engine’s propeller shaft or to a stand-alone “wing” shaft. It’s a neat, practical package that’s been highly refined, if not perfected. Notably, not all generators are offered with a PTO option, nor does their output warrant use of the power. The option is typically available on gensets 12kW and over (the output of a 12kW genset is equivalent to 16hp). The efficiency of such a system, in terms of power transfer from the genset engine to the propeller shaft, is typically in the range of 80 to 90 percent. Therefore, the net expected output should be taken into account to determine if it will propel the vessel at the desired speed in a variety of sea conditions. It must also be kept in mind that power used from the generator’s internal combustion engine to propel the vessel is not available to produce electricity. If you rely on your genset to operate other gear, refrigeration for instance, then it will very likely have to be taken off line while in get-home mode. This is a small price to pay for the luxury of being on your way in the event of a main engine failure, however, it remains worthy of consideration as an aspect of the overall auxiliary propulsion plan. By far the most common approach toward the hydraulic get-home system involves the use of one of the proprietary propulsion systems installed either in line with or adjacent to the existing main propeller shaft and engine. The existing transmission, shaft, and propeller remain an integral part of the vessel’s propulsion system when the get-home system is being utilized. The transmission’s output coupling also continues to turn and support the shaft while the hydraulic unit is in use (more on this later). Depending upon the design, the hydraulic power unit may actually surround the propeller shaft and engage it with a clutch mechanism. (Wesmar, a manufacturer of such a system, offers a unit that can be engaged and disengaged completely by remote control from the helm.) This would be a set-and-forget assembly, requiring the user only to engage it with a manual or remotely actuated clutch. Alternatively, it may be located alongside the shaft and provide locomotion via a belt or chain and sprocket. If the hydraulic motor’s power is transferred to the shaft via a chain and sprocket or belt, a clutch mechanism will need to be used to prevent the engine from “back-powering” and damaging the hydraulic motor when the former is operational. In the absence of a mechanical or electro-mechanical clutch, the belt or chain would need to be installed when the user wanted to power up the system, the antithesis of a set-and-forget system. In such an instance, if the propeller shaft remains attached to the transmission, and it likely would, the chain would need to have an easily manipulated master link and a belt would need to be either of the linked variety or it would have to be unshipped from the hydraulic motor pulley and laced and supported around, but not in contact with, the propeller shaft drive pulley. While this abbreviated approach may be deemed worthy, especially in light of the anticipated infrequency of use, these arrangements require some manipulation and users should be certain they can easily and quickly rig them for propulsion while in a seaway. As a result of the effort required to rig them, such systems are unlikely to undergo regular testing. The advantage of the hydraulic drive approach means the vessel continues to use a propeller that is well protected aft of the keel and steering is unaffected. There’s no added drag from a separate, outboard shaft, propeller, and strut assembly. The drawback is that such a system lacks 100-percent redundancy in that it relies on the existing shaft and propeller. If, for instance, the propeller becomes heavily fouled with a fishing net or line, as has been related by offshore cruisers on a few occasions, or it’s severely damaged or lost all together, the auxiliary propulsion system will be of little use. Still, if the main propeller is swathed in a large net, the wing may be unable to overcome this drag and it, too, will be in danger of becoming entangled when the vessel once again gets under way. The axiom, “There’s no free lunch,” comes to mind. How many times have we all seen floating debris that we’ve missed or avoided? In the end much of it comes down to luck. Alternatively, the generator’s power may be directed to a stand-alone hydraulic “wing motor,” which utilizes its own shaft and propeller much like the aforementioned wing engine. This affords the user, in some ways, the best of both worlds, utilizing the generator’s engine with a stand-alone shaft and propeller. The hydraulic motor occupies very little space, much less than the wing engine, and it requires no raw water, fuel, or exhaust system installation. Yet another variation on the hydraulic theme is the “steerable” outboard stern thruster. Steerable, outboard hydraulic thrusters, one of which is offered by an outfit called Dickson Thruster, are viable get-home options for smaller vessels, and they can be used in pairs to increase thrust. They can be used stand alone, with the necessary related hydraulic pump, or as part of an existing hydraulic system. Whichever system is employed, the results are the same. The power of the generator’s internal combustion engine is utilized to propel the vessel, albeit slowly, and depending upon which of the arrangements are used, with a mix of advantages and disadvantages. For a variety of reasons, start-up loads and motor size among them, it’s impractical to utilize a generator’s AC output for propulsion. However, systems relying on DC motors fall into a somewhat different category. Although it’s not specifically designed as a get-home system, at least one engine manufacturer, Steyr Motors of Austria, offers a parallel hybrid engine/electric propulsion/transmission generator package that is capable of being used in this mode provided a charge source is available. The primary goal of this system is to provide the vessel with hybrid electric propulsion. Such an arrangement can also be used very effectively as a get-home package if a means of charging the battery bank from which the electric motor is powered is provided. The system utilizes a battery bank (Steyr’s is 48 volt), which is charged from the transmission when the engine is operating or it’s supplied with power from a stand-alone charger that is powered by the vessel’s generator, thereby offering a self-contained system. When the necessary charge current is available, this de facto series hybrid electric propulsion system could be operated as a get-home option. While not common or readily applicable to every vessel, a sailing rig is an option that has been successfully employed by some designers and builders. Dashew Offshore’s innovative alloy FPB can set their vessels up for such downwind sailing. Given the company’s sailing heritage, this comes as no surprise. In reality, unless given careful consideration by the designer, trying to make a powerboat sail (efficiently) is a tall order. Again, if the builder has practical experience with such designs then the likelihood that it will work well is certainly greater. Still, even sailing downwind and slowly is better than drifting. The key with such an arrangement is to design, build, and test it before it’s needed. Trying to “manufacture” the necessary components while at sea, not the least of which is the sail itself, will be difficult, if not impossible. The aforementioned issue of the main engine’s transmission, and its use as a lay-forward shaft bearing, is worthy of additional discussion. Indeed, even if the main shaft and propeller are not used as part of the get-home system, they still require attention if the vessel is propelled by other means. If the main shaft and prop are spun from an auxiliary hydraulic motor, the transmission’s output shaft will spin and its bearings will require lubrication. Most hydraulic transmissions (that’s most transmissions used on engines over 100hp) include a pump that supplies pressure to the clutches as well as forced lubrication to the internal components. However, if the transmission is being “back driven” or “windmilled” by another means, from a wing engine or hydraulic get-home system for instance, then it may require supplemental internal lubrication. Most transmission manufacturers provide guidelines for such operation as it’s little different than the approach that would be taken for a vessel that is being towed. Some get-home system manufacturers recommend the addition of transmission case and/or fluid temperature monitoring as a component within the system. Many boatbuilders include this as a standard part of an engine installation, however, unless fully mechanical, they are typically powered from the engine’s ignition circuit, which will be necessarily de-energized when the vessel is under way using the get-home system. If this instrumentation is to be used with the get-home system, it would need to be set up with another power source, one that did not inadvertently energize the main engine’s ignition system, along with the injection system CPU, alternator field, low oil pressure alarm, etc. Additionally, the spinning shaft will impart friction and consequent heat generation to the stuffing box and cutless bearing(s). If the vessel relies on pressurized water injection to provide cooling and lubrication to these components, nearly all dripless and many conventional stuffing boxes rely on such a system, then water must flow from another source. The water is commonly provided by the main engine’s raw-water pump, however, if that’s idle as a result of an engine failure, then water can be supplied either from a stand-alone, continuous duty raw-water pump (electric or hydraulically driven) or it may be tapped, via the appropriate isolation valves, from the generator’s raw-water system. Care must be given to avoid pumping stuffing box cooling water back into the main engine’s exhaust system and then to the engine’s cylinders. If the vessel relies on a wing engine, which by definition does not utilize the primary shaft, then the latter would be subject to windmilling. It may, therefore, be immobilized with a shaft lock mechanism, either proprietary or custom made. Doing so will preclude the need for supplementing the transmission’s internal lubrication as well as lubricating/cooling the stuffing box and cutless bearings. Remember, whether or not this shaft is part of the get-home system, if it’s spinning, its components require sea water for cooling and lubrication and the transmission to which it’s attached may require an auxiliary lubrication protocol of its own. During a sea trial aboard a new vessel that utilized a parallel hydraulic get-home system, I asked the crew to engage the system for testing purposes. It took several tries to get the system to engage, with much chattering and grinding of the integral clutch mechanism in the process. This heightened my awareness of and concern for the robustness of the installation. Subsequently, I asked that the system be engaged and disengaged 10 times consecutively with three-minute intervals between engage/disengage intervals. The system failed to engage several times. Testing a new get-home system, or one that is new to you, requires a protocol that deviates from the above-described monthly exercise program, it requires a greater level of rigor to ensure it will operate properly under any conditions to which the vessel may be subject. My recommended protocol for proving a get-home system, particularly those with a clutch engagement, is to successfully complete 10 engage/disengage evolutions without failure to operate properly. If the system fails to engage/disengage once during this testing, it’s very likely that something is wrong, something that will only get worse over time and with added use. Additionally, a new/new-to-you system should be operated at its manufacturer-specified maximum continuous load rating for a minimum of one hour, preferably three to four hours for an even more thorough test. While one hour is far from a definitive test of any propulsion system, blatant and egregious flaws in the system will likely reveal themselves during these trials. Get-home systems fulfill two vitally important roles. First, they afford the single-engine vessel operator peace of mind, knowing, even if it’s never needed, it’s there. Second, should the unthinkable happen in spite of your best efforts to ensure maximum engine and running gear reliability, or perhaps because of nothing other than bad luck, there is a reliable, safe way to return the vessel and her crew to port. Choose your get-home system carefully, maintain it properly, test or “prove” it thoroughly, exercise regularly, and it will be there when and if it’s needed. Steyr Motors North America, Inc.